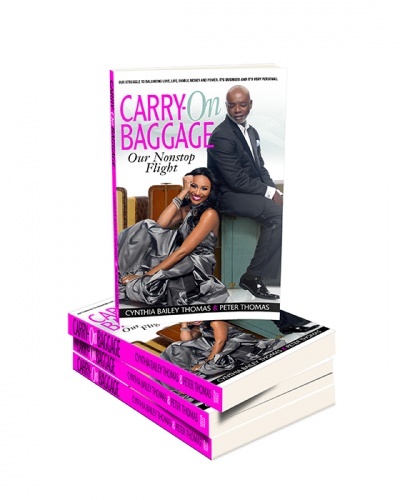 Griffin Scott Press announced a late September release date for Cynthia Bailey -Thomas’s and Peter Thomas’s urban memoir. The book chronicles the couple’s journey of courtship, marriage, financial comebacks and blending a family of six children. The chapters delve into everything from Cynthia’s and Peter’s first date that was fifteen years in the making to their formula for successfully managing six children and five co-parents. “Carry-on Baggage, Our Nonstop Flight” will inspire, provoke and make the reader laugh out loud. The couple will host a media reception, 2:00 pm – 6:00 pm on Thursday, September 19, 2013 at Simply Books, Hartsfield-Jackson International Airport, Atlanta, GA.